Wonderfully minimalistic style, love it. I have implemented damage feedback in the latest version. Thanks for the feedback. Thanks, I want to focus the player into adventure not into action or busy graphics. Love the atmosphere of the ice stage. Looks awesome! I spent 3 days working on the design and the logic for the menu window it will display power up items inside it instead of showing them on the game screen, same goes for the level and experience bar. The window displays current position on the map (not shown in this post), current gold coins (money), recollected crystals (something good will happen if you got them all), consumables such potions among other goodies. I have ready the Item Shop, buy consumables such potions and bombs. You can also buy expensive but necessary magic and heart containers. Dont try to steal the old fella shop keeper. Looks pretty cool. I like the simple style you've got going on here. 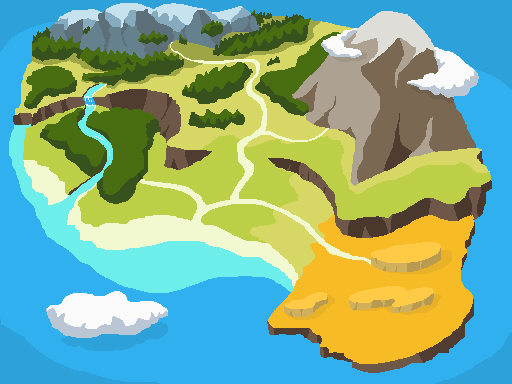 Working on the worldmap concept art. i plan to throw in some secret areas. This is not the finished map just an advance. Finally I have uploaded a gameplay video with sound and music, please note that Sound FX are not final they are from zelda just to fill in the silence. Another quick glimpse of game play, now for the mountain stage. Looks good! Is there another way to advance into the mountain if you don't have any bombs, like a secondary route with dangerous enemies that you could've avoided if you'd had a bomb, or do you need to go back to a shop to get more bombs? This is demostrative,not final. But the game is not linear most of the time blocking ways are for special or secret areas. 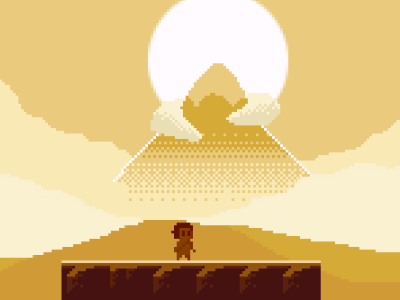 This how the desert stage is gonna look, I applied a tint blend to the sprites in this particular stage. Also i have set up a preorder page hoping i get some funding to continue the development at full time if you like the idea of my game please consider preordering and you will get access to the progress playable demo, a 1USD off discount and the OST. Finished the AI for the knight baddies. Tried to make it similar to zelda 2 stalfos but since Elliot cannot crunch i came with this solution. I have finished the logic for the minimap metroid style. Will render the explored areas and will mark in white the current area. I am about to release an alpha demo for my upcoming game "Elliot Quest" and i need a people to play it and hear their opinions and possible bugs detection. - You have played a zelda or castlevania game before. - You love the pixelart style on games. - You will play the demo game and you will report by email your opinions by answearing a small form. I have 4/5 vacants for this i cannot pay you anything but you will be on the final credits of the game. You can buy the stage maps from this guy. and share your impressions, this is still a work in progress.